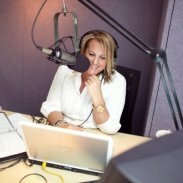 Lisa J. Smith and her daily radio show are looking for a new home. Lisa J. Smith, The New Voice For A New Age. Lisa J. has quickly become loved by listeners and respected by broadcasters as an acclaimed host on CBS Radio’s The Sky since the launch in April of 2008. Lisa J. Smith encourages her listeners to tap into their own inner ”Rock star” by empowering them to “change their perspective and change their lives”. Lisa uses her daily talk show as a platform to bring about change, healing, education, enlightenment, and laughter to a sometimes difficult day for each one of her thousands of listeners. Her show provides not only her voice to be heard but also the voice of each listener. As Lisa says, "By being born, you already change the world. Now you are the only one who needs to believe it". Lisa J. has used her intuition and ability to connect to change the lives of thousands of people with private sessions, lectures, and through her nationwide talk show, Lisa J. NOW! She brings a down to earth perspective and practicality to her work that is rare to find. Many have found her to be their “diamond in the rough”. Her approachable and girl next door personality, touches listeners of all demographics with deep powerful messages delivered in a real down to earth way. Lisa touches people at their core and helps them bring about real change in their life by empowering them to find their full potential. Helping bring people together all over the globe with her CBS Radio show and her lectures and appearances, Lisa is and will continue to be a positive force for change and bringing about collective enlightenment. Listeners are friends, her show is the gathering place and her messages and stories are the catalyst for real change in listener’s lives. "Lisa J. Smith is a key asset to New Sky Radio. She brings a unique perspective, a sense of fun with our listeners and most of all, dedicated fans to our station."